Since the existence of Israel itself has symbolic and heavenly overtones from the beginning, the fulfillment of prophecy encompasses these same overtones. The eschatological time is the time when the symbolic overtones in the very nature of Israel itself are transformed into reality… Eschatological prophecy may indeed have the same two dimensions: the dimension of the symbol in itself, and the dimension of what the symbol symbolizes. But the time of fulfillment of the eschatological prophecy is the time of climactic revelation. Hence, it may well be that, at that future time, the symbol is superseded by the reality, and no longer needs a separate historical realization along side the reality. In my opinion, that is an excellent way of explaining how the nation of Israel was a shadow of the kingdom of God, a nation that is not of this world – as well as how Abraham’s physical offspring, in the way they benefited from God’s promise to Abraham (Ex 6:5; 32:13, etc), were a shadow of Abraham’s spiritual offspring – a distinction that was not clearly made until the New Covenant age of fulfillment. 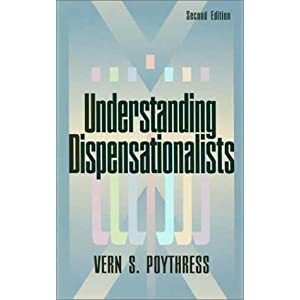 And so Poythress’ extended argument that the symbolic overtones in the very nature of Israel itself are transformed at the coming of Christ cuts against dispensationalism, but also against his paedobaptism – leaving him without a defense against the baptist argument that the nation of Israel was only a shadow of the church, not the church itself. ii) Gal 3:6-14 and the Mosaic Administration – Venema appeals to Ridderbos to essentially make the same point made about Lev 18:5 above, adding that Paul’s argument is ad hominem, showing the legalists from the law itself what they must do if they abstract the law as a means of justification (they must do it all). i) One in Substance, Diverse in Mode of Administration – “Though the authors of the volume profess their adherence to the historic Reformed theology of the covenants, they offer an account of the Mosaic economy that seems at odds with the classic Reformed position that there are only two covenants, a prelapsarian covenant of works and a postlapsarian covenant of grace, of which the Mosaic covenant is a particular administration. The traditional formula of Reformed covenant theology, that the covenant of grace is one in substance though diverse in administration, entails that the Mosaic covenant was substantially a covenant of grace and only accidentally distinct from other administrations of the covenant of grace. This means that the distinctive features of the covenant of grace, which distinguish it in substance from the covenant of works, characterize the Mosaic administration in its entirety. It also means that whatever features of the Mosaic administration distinguish it from other administrations of the covenant of grace belong to the category of adjuncts or accidents, which do not materially affect its nature or character. I think its the most helpful introductory article I have found to give to someone struggling to understand what it means to not be under the law, but under grace. “The other subdivision of the question is a more difficult one: Whose children should be baptized? It is not at all difficult to show that a child of two believing parents should be baptized, nor even that a child of only one believing parent should be. 1 Corinthians 7:14 is sufficient. The difficulty arises when one considers the case of a child whose parents were perhaps baptized in infancy, who attend church services with some regularity, and who want their child baptized, even though they themselves have never become communicant members. Today in the United States the very large majority who are in regular attendance are communicant members. But it so happens that regular attendants who are not communicant members want their children baptized. Should the church acquiesce? In Europe and in early America the children of baptized but non-communicant members were regularly baptized. Robert Ellis Thompson, in ‘A History of the Presbyterian Churches in the United States’ (1895, p. 14) reports: “The absence of regularly constituted sessions for the administration of church discipline, and the refusal of baptism to the children of baptized person who were not communicants, marked the local congregation as un-Presbyterian.” That is, communicant membership was not essential for the parents of infants to be baptized; and the author notes this was the rule in all the Reformed churches. But now, beyond admission for the sake of argument, what must be said on the substantial question? Does the Bible require or prohibit baptisms to the thousandth generation? If it does, and if a generation is roughly thirty years, a thousand generation from the time of Christ would include just about everybody in the western world. Then the church should have baptized the child of an intensely Talmudic Jew whose ancestor in 50 B.C. was piously looking for the Messiah. Or, George Whitefield should have baptized Thomas Jefferson, Benjamin Franklin, and Tom Paine, as children, because one of their ancestors played a small role in the Reformation. Strange as this may seem to many, it ought to have been done if the Bible so teaches. This emotional pietism, as it demanded a particular type of experience for regeneration, tended to view the ideal church as consisting entirely of regenerate persons sharing such an experience. The logical result is the Baptist position; but in Presbyterianism it stopped short at requiring the faith of the parents who wanted their children baptized. But if it did not result in Baptists practices, it involved a change in the theology of baptism.